The main subjects of analysis of any trading system, in general terms, are time and risk. Many beginning traders pay attention primarily to the potential profit, but this is fundamentally wrong, because of our inherent greed prompts us to overestimate the odds of winning and underestimate the chance of ruin. Therefore, as the trader matures he should be guided by the principle of minimizing potential loss and only then pay attention to potential rewards of a trading system. So, time and risk. How are they involved carry trade strategy? The fact is that when we open a carry trade it’s not the exchange rate change that makes core profit for us but earned interest from “investing” in the currency that we buy. This opportunity exists because of the difference between the risk-free interest rates in the currency that we are selling and the currency that we are buying. It is reasonable to assume that the longer we lend, the more interest we will get. If the annual rate is 10%, then by lending $ 100, we will receive $ 110 in a year, but only $ 105 if our loan will be used only six months. Therefore, the time to which you are lending is important, since your interest income will depend on it. For example, the minimum interest rate on loans in the US is now 1.5%, and in the Russian Federation 7.25%. Attention: risk-free rates are the coupon rate on government bonds. After all, you will agree – the government of the country is the biggest “firm”, which cannot pay its debts only in rare cases, that’s why have highest credit rating domestically. For example, it can increase taxes for the nation to raise more money and repay debts. But why, after all, does the interest rate vary between countries? Because there is a difference in credit risk between the countries. Agree, you would lend to the US government more willingly than the government of Russia because the risk that the latter can not repay the debt is higher. Therefore, the Russian government will have to offer you an interest higher so that you agree to lend money to them. And the US government, confident in its creditworthiness, will offer you a lower interest. So, after picking currency pairs for carry trader strategy we can see that the interest rate difference of USDRUB is 5.75%. How can we make a profit? The first thing that comes to mind: take 100 thousand dollars in the US, at a rate of 1.5%, exchange them into rubles and lend to the government in Russia. It seems that we do not lose anything at all, and we can safely go to the bank for a loan. However, the source of risk is the USDRUB exchange rate, because for the time we earn interest, the rate may change for the worse for us. Obviously, we will not earn anything and will stay at breakeven if the ruble depreciates by 5.75% (excluding transaction costs). If the ruble loses more, we will suffer losses. It is important to understand that the more we keep our trade “open”, the greater the uncertainty in the exchange rate at the time the transaction is completed (the exchange of rubles back to dollars, that is, fixing profits). However, the Ruble can not only depreciate but also grow against the dollar, then we will still earn extra money on currency speculation. It is important to understand that the more stable the state’s economy, the lower will be the interest rate on federal bonds. Therefore, if the macroeconomic situation in the country took the course for recovery, the reduction of the difference in currency rates becomes an additional danger. So, we are faced with a primary dilemma of carry trade strategy: how long should we keep our funds in rubles and receive interest (time factor), so as not to lose on changes in the exchange rate and interest rates (risk factor)? It is this choice between time and risk that determines the pitfalls of carry trade strategy. This is an equation for Covered Interest rate Parity. 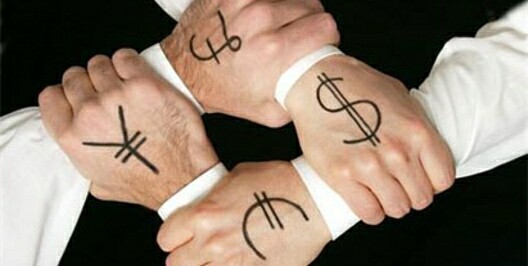 This will be the exchange rate of the forward contract, which another party can offer you now. It is called Uncovered Interest Parity. 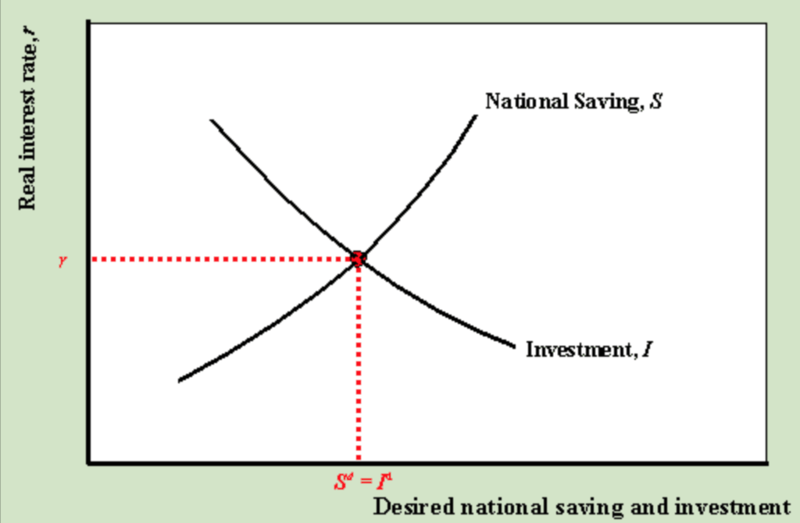 Where F(t) – the forward exchange rate is known today, S(t+1) -future exchange rate which will be realized in t+1 time, S(t) – spot rate today, RX(t+1) – carry trade strategy return in period t+1. However, is it worth expecting the depreciation of the exchange rate on the value of the difference in interest rates or more? Covered interest parity evidence shows that this does not always happen and the currency in which you invest depreciates less or even gets stronger, which brings additional income to the traders. This is called forward premium puzzle. CIP theory fail happens for various reasons, for example, because of the increased inflow of carry traders what makes the exchange rate more stable, as the currency that has higher interest rate should have an increased demand. It means there are a large number of carry traders who are confident in the strategy and are making efforts to implement it. Another reason is the improvement of the macroeconomic environment (good data on GDP, unemployment, inflation), etc., which also make carry trades confident that abrupt economy shocks won’t produce sudden currency devaluation. At the same time, the policy of central banks is quite cautious, therefore they will gradually reduce rates, making sure that they will not cause a sharp outflow of carry traders and their actions will not become a shock in the foreign exchange market. The next reason is the low-interest rate staying for a long time in a currency you borrowed. After all, if the Fed starts raising rates, it will cause a reduction in the differential of rates and lower possible returns from the carry trading strategy. It is logical to try to anticipate the changes in the economic situation and subsequent rate shift and respond to timely threats. I’d like to talk about this in more detail. As the currency value is directly driven by central bank measures for controlling the money supply, it’s reasonable to examine what motivates the policymakers to make changes in the monetary policy. Considering “unemployment-inflation” trade-off which policymakers face it’s useful to study how those both gauges of economic health affect9y7 the currency value. Monetary decisions obviously should be viewed as a “propagation mechanism” that links changes in main economic indicators to currencies rise or drop. I chose the United States Dollar and Russian Ruble as the low-yield (safe heaven) and high-yield currency, respectively. The timeframe of investigation is January 2010 – September 2014, relatively calm time after the mortgage crisis and before the oil market collapse, where exchange rate fluctuations were not so wild, and sentiments had been relatively stabilized. 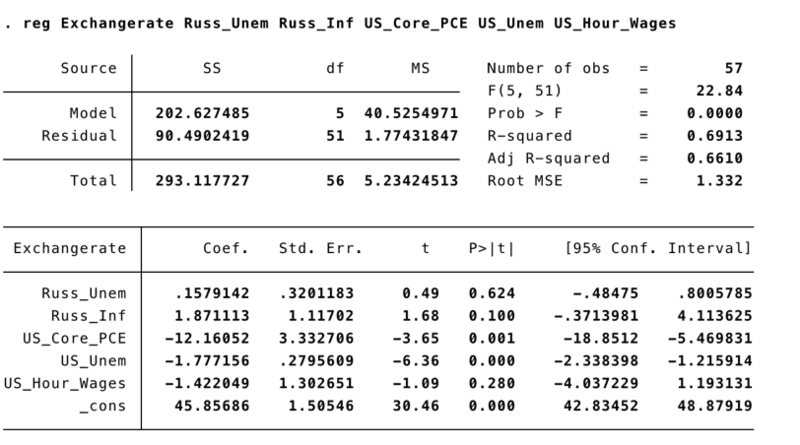 As we can see the coefficients for Russian Inflation and Russian Unemployment are not statistically significant while the reverse is true for the US. The conclusion from this is that market participants, according to these results, tend to pay attention to changes in the country of borrowed currency, and not quite bothered with economic data of the investment currency. It’s goes in line with CCAPM theory as most of foreign carry trades in ruble are from the US where changes in borrowing costs significantly affect consumption decisions. As expected, CIP doesn’t hold as coefficient of “rate diff” variable is statistically insignificant. Also see there are huge residuals what means explanatory power of the model is extremely low. These results say that exchange rate of USDRUB is not determined by difference in the interest rates of US and Russia. So carry trade strategy should work in this case and yield positive returns providing certain conditions are met that we discuss further. Leverage in details: How it works, Pros and Cons.